This Valentine Season brace yourself for another fabulous edition of the monthly affordable retail shopping experience LIVE in Lagos. 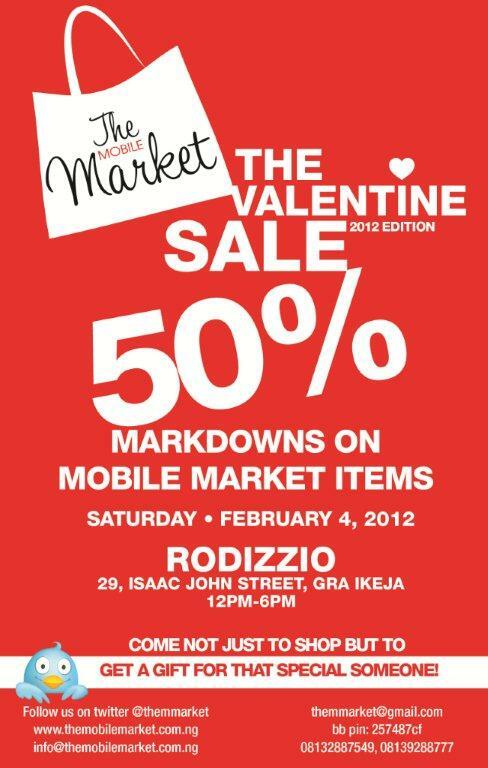 This edition tagged “The Valentine Sale 2012 Edition“, will see attendees shop for clothes, shoes, jewellery, lingerie, hair extensions, accessories, art, food, drinks, beauty supplies and much more from over 25 vendors stocked with unbelievable items that will make you spend every Naira you have. effective fashion for the average Nigerian by retailing fashion items and organizing monthly fairs to provide a platform for S.M.E’s and designers to showcase their works at an affordable rate. So what ever you want to buy this February, The Mobile Market’s Valentine Sale 2012 Edition has got it all plus you get a 50% discount off every item you buy. Brings your friends along. Venue: Rodizzio, 29 Isaac John Street, G.R.A. Ikeja, Lagos, Nigeria. Abinibi Creative Academy Presents ACDP One Week Crash Course! !